They spent 191 days in combat—the longest of any division. Now, their song is sung. For being known as the Great War, World War I often gets overshadowed by World War II. We'd take a stab and say most people didn't know that the 100th anniversary of WWI’s inception comes up this July 28th. And, another thing that overshadowed from the time period is the contribution of African-American soldiers in WWI. We'd like to change that—starting with the most famous: the 369th Infantry Regiment. Known by many names, the one that stuck was the one given to them by their German enemies: The Harlem Hellfighters. During the beginning of the 20th century, African-Americans in the United States faced unrelenting racism. Before President Woodrow Wilson asked Congress to declare war on Germany on April 2, 1917, blacks in the U.S. had to enlist with the army of either Canada or France if they wanted to fight. The 369th arrived on the battlefield just in time to face the Germans as they concentrated nearly all their war efforts on the Western front. 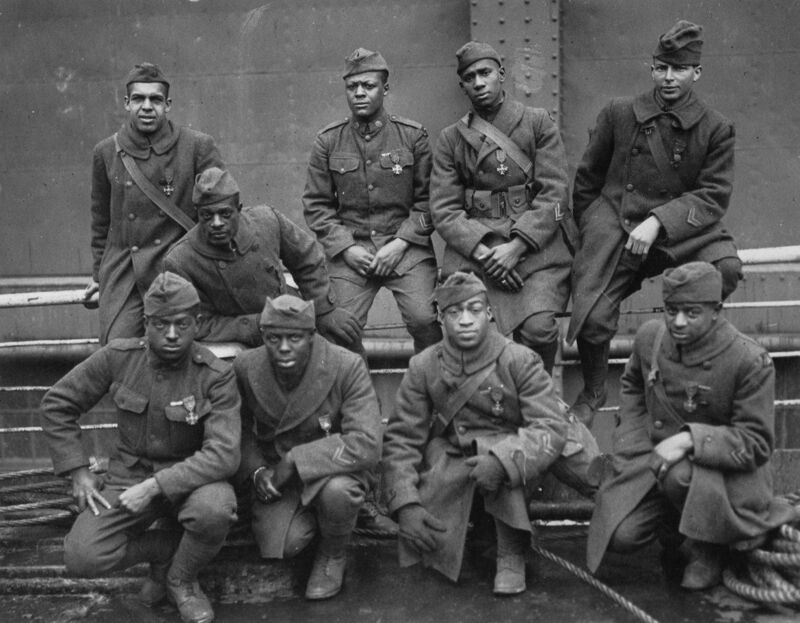 These men were the first African-American soldiers to arrive as part of the American Expeditionary Force (AEF). With them, the soldiers brought hope—hope that their bravery on a foreign battlefield would dissipate the vicious hate they faced back home. Their legend soon spread, earning them fame amongst the French units they fought with—unsegregated, as brothers. Tales of their bravery spread to Europe and America, with newspapers heralding their triumphs. All said and done, the Harlem Hellfighters spent 191 days in combat, longer than any other American unit. They were the first Americans to receive the Croix de Guerre, a French military decoration for heroism. Their band, lead by soon-to-be famous bandleader James Reese Europe, became celebrated across Europe and spread a then-unknown jazz as far as Britain. Upon their return in February 1919, Col. Hayward pulled some strings, and the 369th received the parade they deserved. Crowds stormed Fifth Avenue in New York City as the soldiers marched to their own jazz music. Unfortunately for the Hellfighters and other blacks living in a post-WWI America, the color line was not exactly over. Historically, African-Americans faced some of the worst post-Civil War racism following the First World War, up until the next wartime distraction: World War II. There was one especially important development in this next era in African-American history. Due to the war effort, most immigrant workers were barred from entering the country. Blacks living in the Jim Crow South took advantage, traveling north to cities like New York in droves. This was the Great Migration, the single largest internal migration in U.S. history. With this mass-migration and resettlement, black culture became mainstream. The Harlem Renaissance produced masters like Langston Hughes. Black music became American music—the Jazz Age had begun. Despite the racism they faced, African-Americans from all walks of life volunteered to serve their country. The hope of showing white Americans that they could fight drove them to unfathomable lengths. The men of the 369th could not be deterred. They were known by several impressive names—the Black Rattlers, the Men of Bronze—and the fact that their hated enemy gave them their most lasting nickname is proof enough of their fearlessness. The Harlem Hellfighters demonstrated this bravery in the trenches and returned to be celebrated, even if temporarily, like true individuals at last. Also check out the recently released graphic novel The Harlem Hellfighters, written by Max Brooks, author of World War Z.